BAN founder Jim Puckett visited various e-scrap recyclers in Asia and Africa to verify compliant conditions. There are ‘holes’ in Europe’s circular economy, says the Basel Action Network after conducting a two-year long study on illegal exports of electronic scrap. Of the 314 tracked units of equipment deployed in the study, 19 (or 6%) were shipped abroad. GPS trackers were installed in desktop computers, printers as well as flatscreen displays. The 314 end-of-life devices originated in Germany (54), Italy (48), Spain (45), the United Kingdom (39) Belgium (29), Ireland (24), Poland (20), Denmark (20), Austria (18), and Hungary (17). Of the 19 exported units found in the new study, over 60% were shipped to developing countries. ‘These exports were highly likely to be illegal,’ notes the Basel Action Network (BAN). 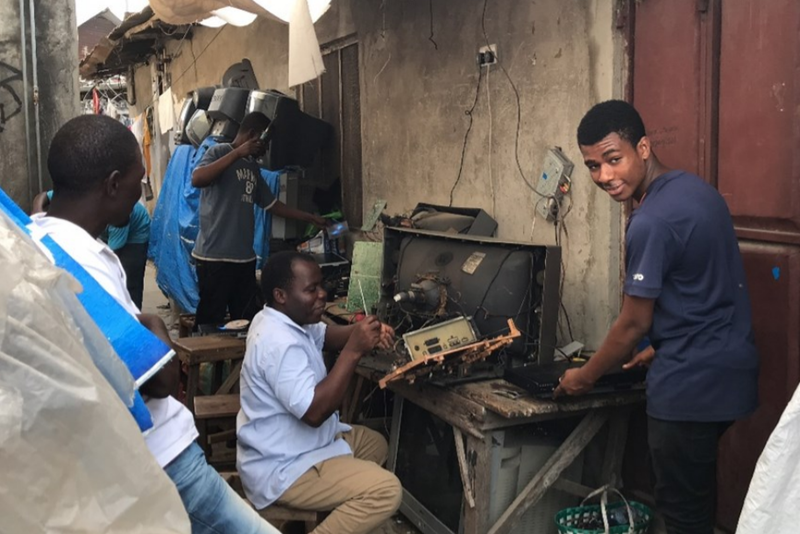 Africa was by far the region of the world ‘most targeted’ by EU e-waste exporters, receiving close to 40% of tracked e-scrap leaving the EU; most were shipped to Nigeria, followed by Ghana and Tanzania. 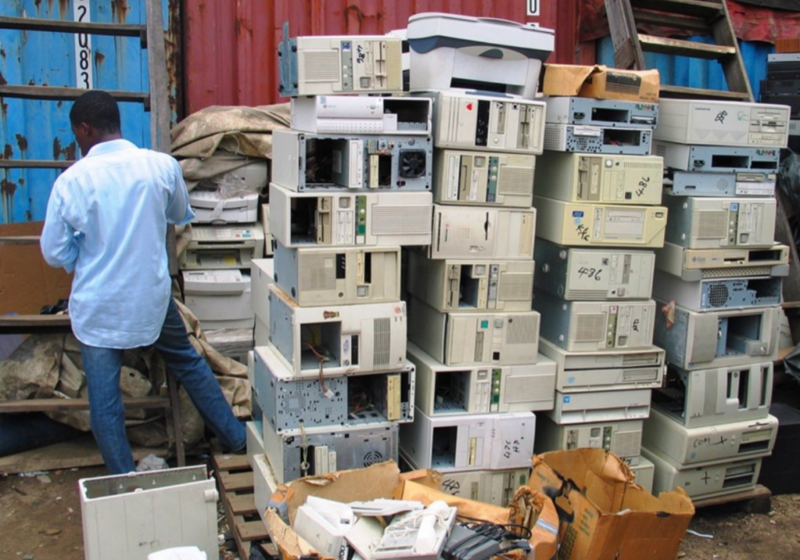 ‘If we extrapolate based on continental volumes and our study’s percentages, we arrive at an estimated flow of 152 600 tonnes of e-scrap per annum moving from Europe to Africa,’ BAN reports. Meanwhile, the nation exporting the most e-waste was the UK with 5 shipments, followed by Denmark and Ireland with 3 each. BAN points out that 19 exported hazardous waste electronic devices out of 314 ‘may not seem like a serious concern’. However, based on national export rates of the ten countries included in the study, it is evident that the 19 exported units could represent as much as 421 603 tonnes of e-scrap exported every year. This is enough to fill around 19 165 intermodal containers. BAN estimates that 20 887 tonnes (or 16 821 containers) would be flowing to developing countries. Taking into account exports all 28 EU countries, the volume could amount to 352 474 tonnes. This is enough to fill 17 466 intermodal containers which would span 401 kilometers. The magnitude of hazardous waste exports is both ‘frightning’ and ‘unacceptable’, BAN argues. It proposes that ‘far more can be done to prosecute the robust illegal trade, including working with target countries such as Nigeria to stem the toxic tide’. One positive thing is that Europe’s 6% e-scrap exportation rate is ‘far less’ than the 40% found leaving the United States in BAN’s first tracking experiment two years ago. The big difference in e-scrap shipments is due to the fact that America has not implemented any laws forbidding such exports.